Can I dye a dry-clean-only silk jersey dress that lost its color? Jacquard Acid Dyes are concentrated, powdered, hot water dyes that produce the most vibrant possible results on protein fibers including silk, wool, cashmere, alpaca, feathers, and most nylons. Superior to all-purpose dyes. Message: Can I dye a silk jersey fabric that lost its color? My favorite black dry clean only dress was washed by my ever-so-helpful mother and is no longer a true black. Would you please recommend a brand, and a method? Thank you! "FAQ: Can I dye a dry-clean-only dress?" If washing doesn't damage the dress, other than by fading inferior non-washfast dyes, then you can dye it. The easiest way to dye washable silk a solid color would be in the washing machine, using either acid dye (such as Jacquard Acid Dye) or Procion fiber reactive dye, closely following all the details in a good recipe for the type of dye you choose. You can find good recipes among the links on the page "How can I dye clothing or fabric in the washing machine?". 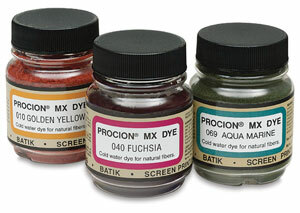 Note that you will need a lot more dye powder for dyeing black than for dyeing another color. Most Procion blacks produce off shades on silk, since they're balanced for use on cotton, but the "Silk Black" color of Procion dye sold by PRO Chemical & Dye will produce a decent black, if you use enough of it. Black acid dyes do produce black on silk, though again only if you use enough dye; unlike Procion MX dyes, acid dyes require very hot water to do their best at dyeing.